COVINGTON, Ky. -- Every sister who takes her vows at St. Walburg Monastery of Covington, Kentucky, receives a gold ring symbolizing her commitment to the Order of Saint Benedict and its principles: Humility, reverence to God and generosity toward the sick, old and poor. When she dies, her ring is placed in a velvet-lined memorial box alongside dozens of others to commemorate her dedication to the church. During the monastery's entire 159 years of existence, Sister Aileen Bankemper said, no one has ever dared to steal one. On Monday, someone stole more than 100. "There was a sense of just emptiness," Bankemper, the prioress, said of discovering the burglary. "There was just like, 'Why would somebody do that?' We're a generous community. It somebody had a need for money, they could have come to us, and we certainly would have listened to what their need was." The rings disappeared while the sisters were attending a memorial service for 88-year-old Sister Cecilia Dagle, who was known during her time at the monastery for her kind spirit and habit of writing birthday cards for each of her fellow sisters. When they returned, someone had stolen "a significant amount of money" and more than a century of history. 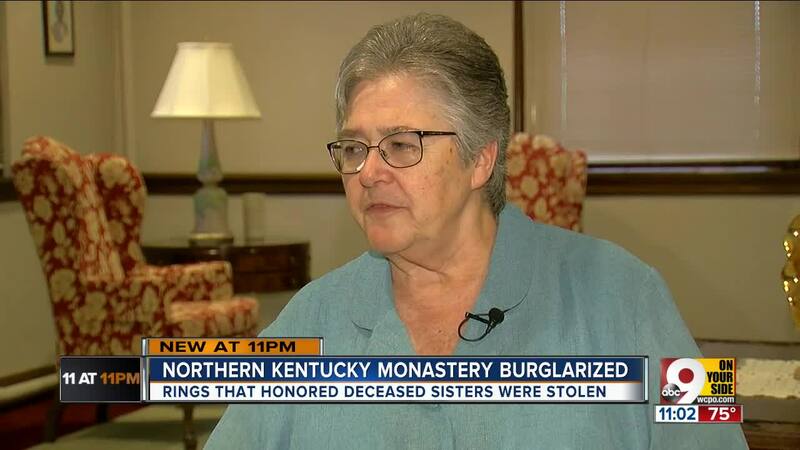 Sister Nancy Kordenbrock said police believe the person who stole the rings, which were 14 karat gold, would have done so intending to pawn them for cash. The collection could represent a tidy sum, but she and the rest of the order don't care about the financial loss. They just want the mementos of their friends and predecessors back where they belong. "Even if they just put it by the back door or by the porch, give it to someone and say, 'Put this here' or something, we would be so glad," she said. "It would just mean a lot to us to have them back."